Several volunteers at Hypatia-in-the-Woods, myself included, are now involved in the production of the second poetry broadside. For this edition of the membership premium series, we decided to incorporate the effect known as suminagashi – treating the paper with this technique before printing Laurelyn Whitt’s poem “Well Without End.” on the prepared sheets. We were looking for a unique effect that would complement the language of the poem. Suminagashi takes on the appearance of flowing water. 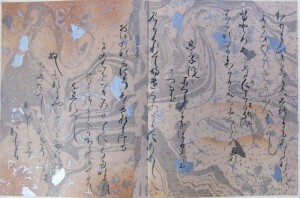 Two pages of waka poems by Ōshikōchi Mitsune (859?-925?). 20cm height, 32cm wide. Silver, Gold, Color, and ink on suminagashi paper. 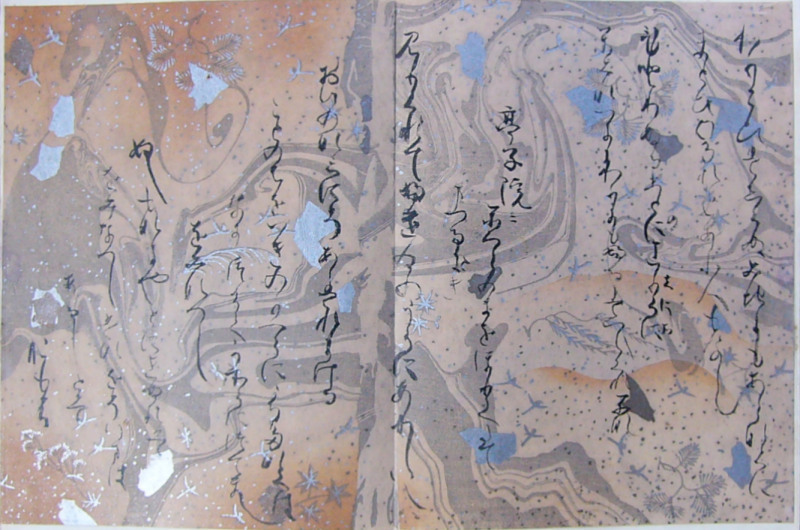 From a copy of the Sanjurokunin Kashu or “Thirty-Six Immortal Poets” kept in the Hongan-ji Temple, Kyoto. This multi-volume manuscript, which contains the oldest examples of marbled paper known today, was presented to the Emperor Shirakawa on his sixtieth birthday in 1118 C.E. “墨流し suminagashi, which means ‘floating ink’ in Japanese is the oldest method of decorative paper made with floating colors that is known today. Author Einen Miura states that the oldest reference to suminagashi papers are in the waka poems of Shigeharu, (825-880 CE), a son of the famed Heian era poet Narihira. Various claims have been made regarding the origins of suminagashi. Some think that it may have originally come from China. Others have proposed that it may have derived from an early form of ink divination. Another theory is that the process may have derived from a form of popular entertainment at the time, in which a freshly painted sumi painting was immersed into water, and the ink slowly dispersed from the paper and rose to the surface, forming curious designs. Our first session was a lesson in “how-to” – experimenting with various kinds of paper and ink, to see what would work best and produce the best results. We took turns both creating the ink patterns on the water, and laying down the paper on the surface. Effects were created using a traditional fan, a feather, and blowing through a pipette. We managed to produce eight finished pages over one evening. Now we only have to do forty-two more! Doesn’t it sound intriguing? If you have some experience with suminagashi or other paper marbling and are interested in helping with the preparation of the paper, we are having other sessions of suminagashi at the print shop in the basement of Ludgate (Elspeth’s house) until the project is completed. Call (427-0760) if you would like to help! We hope those of you who receive the finished second poem as your “perk” for new membership – or who have got the first broadside and intend to collect the rest – enjoy the results of our creative activity! 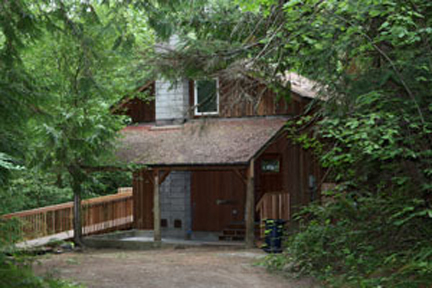 This entry was posted by Guest Voice on July 6, 2012 at 9:31 pm, and is filed under Membership. Follow any responses to this post through RSS 2.0.Both comments and pings are currently closed.